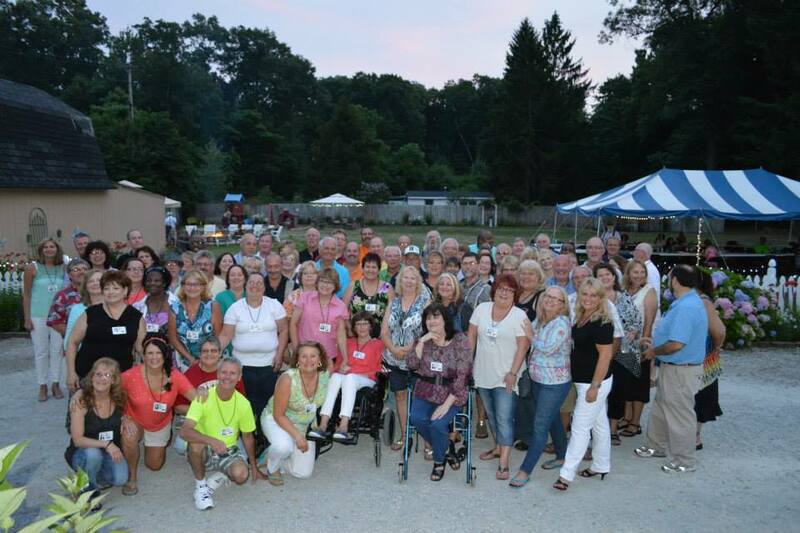 On a recent Saturday evening the Reeths-Puffer Class of 1974 gathered together at our classmate Jill Boeve Wiggin’s house to celebrate each other. We celebrated the long-standing friendships we’ve cultivated for so many years. The weather was absolutely perfect to be outside on this gorgeous summer night. Jill and Brian’s yard is beautifully landscaped with some of my favorite flowers blooming brightly against a white picket fence. The reunion committee was made up of Jill Wiggins, Kristi Buris, Kurt Boerman, Carla Jolman, Kristi Fagan, Deb Couch and Rita Fowler. I’m sure we all attended the reunion with a little anxiety, even the most confident probably were a little anxious. Because of our life lessons we came together as friends accepting each other as is. For me, I was less stressed for this reunion than ever before. My class has always been close and this past year they proved it to me with their amazing love and kindness. It seems as though I would have been more stressed given my physical condition but somehow I was at peace. I was at peace because of all of you accepting me just the way I am. Throughout the evening I heard many stories, some of hope and determination like Denise Laban saying, “This reunion is my first and I thought it was time I start getting out.” This may have been Denise’s first renunion in 40 years but somehow she found the courage to attend and I’m so glad she did. I’m so proud of you, Denise. I heard a love story from Pat Slayton similar to ours. Pat’s wife Kim suffered a stroke and he is currently taking care of her at home. His story mirrors our story because we all thought we would be entering retirement free of a work schedule and ready to play but we were wrong. Instead Pat and Mark are working harder than ever by caring for Kim and I.
Carla Jolman made a beautiful quilt which was raffled off to raise money to be donated for cancer and ALS research. The theme for the evening was Italian and Jill, Kristi and a few others made the food which I’m told was great. What an enjoyable evening you described. All the classmates sounded excited and humbled to be there. I believe we all looked to “retirement” a bit different than life turned out. But, friends and family seem to be something God provided to weather out the storm. Praise God. You, Mark and every Lambert are such a joyous gift from Him to our family Rosemary. Look at all those life’s you have touched and changed in a positive way. You are a blessing to everyone!